Do you have a nice stash of tapestry yarn but still feel like you can't get quite the color effects that you're looking for? Do you struggle with bringing life and movement to your tapestry designs? Using tapestry techniques to blend color is an important characteristic of tapestry weaving. This course addresses using techniques such as hatching, hachure, and pick and pick to create optical effects. In it we also play with blending colors in the weft bundle to create the illusion of transparency or create new colors from the optical effects of color mixing. These techniques are specific to the medium of tapestry weaving. Yarn colors do not blend like colors of paint or dye and due to the weft-faced structure of tapestry, color mixing is also different than in other forms of weaving where the warp shows. This course teaches different techniques you can use to blend your yarns to create the effects you see in your mind's eye. I started a new tapestry yesterday and I used the gradation technique you teach in your online class. What a difference in my gradations! I really appreciate all the work I know it has taken for you to put together these classes. I teach a lot of in-person workshops and I love meeting students face-to-face. But I found that students would go home and have further questions, get discouraged, and the loom would end up in a closet until the next workshop six or twelve months later. As I watched tapestry students come to my workshops with the work on the loom from whatever the last workshop they took was, I realized there had to be a better way to learn tapestry weaving. I wanted to create a learning environment more like what I experienced as James Koehler's apprentice... one that extended over a good chunk of time with consistent feedback and the ability to ask questions at any time. Using color gradation in tapestry is one of my specialties. I teach a workshop on this subject but I always wish for more time to explore the material more carefully. This online course gives us the time to do that. What does Color Gradation Techniques include? Printable PDF handouts with exercise instructions, diagrams for the techniques, photographic examples, and design ideas to try. Extensive video teaching. All techniques are demonstrated, often in a couple different ways. The ability to ask questions on every page of the platform about anything in the course. I will reply within 24 hours! Troubleshooting: videos and handouts explain common problems you might encounter and demonstrate how to fix or avoid them. Discussion with fellow students all over the world helps clarify potential problems and solutions as well and share more general understanding of tapestry practice. Continued bonus material throughout the class created by me in response to your particular questions. Feedback: the opportunity to submit photos of your progress and perhaps problems as you have them. Invitation to a secret Facebook group where students in the program and those who have graduated can continue to connect over a virtual cup of tea. This is completely optional and not connected to the course in any way. Any-time access to the material. The content will be available for as long as I am teaching online. absolute beginners. If you've never woven tapestry before, please consider my course, Warp and Weft: Learning the Structure of Tapestry first. people who don't appreciate my silly sense of humor. It comes out in the videos, though primarily in the outtakes at the end. If you can't put up with my upbeat, cheerful humor, this course isn't for you. THIS video has an outtake at the end that is an example of this silliness. anyone looking for a comprehensive color theory course. This course is a techniques course aimed at learning how to move color around. It does include some color theory, but is not a comprehensive review. professional tapestry weavers. If you've been weaving for decades and are a master of this medium, this course will be too rudimentary for you. This course is hosted in an online platform called Pathwright. It is designed as a linear path that steps you through the learning process one piece at a time. There is an overall menu that you can return to at any time to skip backwards or forwards as necessary. It is largely video-based. If you pay for your internet services by the gigabyte, this course is not for you (unless you don't mind paying). If you are able to view standard YouTube videos, you will be fine. This course does work on iPads and is compatible with Mac or PC. It is also mostly mobile responsive. Browsers: Google Chrome is the recommended browser for Pathwright, however Mozilla Firefox and Safari also work well. Please update your browser to the most current version for the best viewing experience. Oh my gosh Rebecca ... I can’t thank you enough for having the vision, the talent, the knowledge and the love of tapestry to share with us all. You have created impeccable online courses to study the art of tapestry right from home. Your way of presenting a rather complex art is easy, fun, and so rewarding. Thank you for being the one there in the internet world that I found ... I was searching and searching and there you were. Your blog inspires and your smile is precious! I have fallen in love with Tapestry all over again! encouragement and a framework within which to practice! With this option you get all the material in one class. The course is divided into six parts, but they are all available to you immediately. You can work through it at your own pace and I will meet you wherever you are in the curriculum for teaching and troubleshooting. You also have the advantage of being able to skip ahead to videos presented later in the course. There are six parts in this course. You can take just the ones you're interested in. You will be able to ask me questions and submit work for feedback in the same way you would if you took the entire course. This is the same information minus any interaction from me. You will not be able to submit photos of your work for feedback though I do love seeing completed pieces at the end of the course. You can visit my course catalog on the Pathwright platform and see a complete list of videos and steps included in each of the classes. This is also where you register for the course. Here is a little summary of each part of the course. Color Theory Basics and Weft Yarns for Tapestry: A basic introduction to color theory and a discussion of weft yarns available for tapestry (Yarns from the USA, Sweden, Norway, UK, and Australia are featured). Irregular Hatching: We covered this in my Warp and Weft: Learning the Structure of Tapestry class. We go into more depth in this course including using hatching for shading and form creation. Hachure: This traditional tapestry technique was used a great deal in historic European tapestries and is still used by many people today. This class also offers tips on how to make straight lines and shallow curves smoother and how to start to minimize steps in your work. Transparency Effects: This class talks about using regular hatching and weft bundling to create the illusion of transparency. Weft bundling is also an important concept for all color use in tapestry. 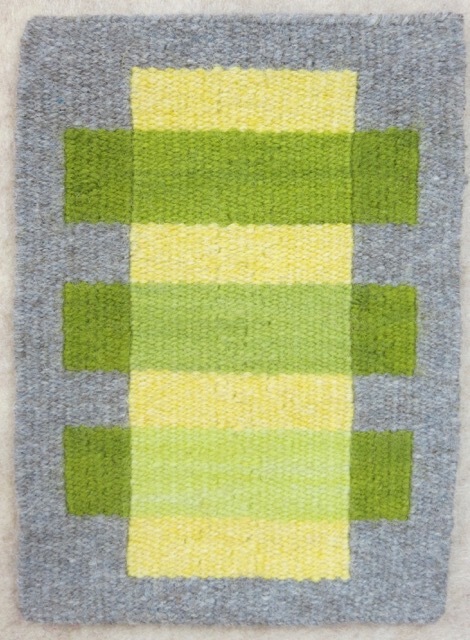 Pick and pick: This fun technique was taught in Warp and Weft: Learning the Structure of Tapestry. In this class we take it farther and look at using pick and pick in shapes and for blending colors vertically. Vertical Gradation: This class will show you how to make smooth color shifts up your warp. We will also talk more about using value and hue in color grading and grading with stripes and demi-duite. Thank you very much for your prompt action. I don't give refunds on this material. Please ask questions before you purchase. I believe in my courses and I think you will find that they are everything I and my current students say they are. Please note: The only issues I have had with people wanting refunds were centered around internet access. I am serious when I say that you cannot do this course if you have dial up internet or if you pay for your internet by the GB (if you use a cell phone plan for instance, unless you are willing to pay for greatly increased data usage). Do not register for my courses if you don't have access to fast enough internet to stream video. I will not give refunds for this or any other reason. That includes having a computer system that is too old to support modern programs. You must have updated equipment. As soon as you register you will receive an email from Pathwright with a link to the class. You can go to the Pathwright class platform and start your class. If that email goes to your spam folder and you can't find it, push any registration button on this page or go HERE. Click the Sign In button on the top navigation bar and once you enter the password you created when you paid for the class, you will see your courses. I hope to meet you online soon!